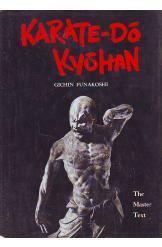 Karate Do Kyohan The Master Text by Gichin Funakoshi and translated by Tsutomu Ohshima, 256 pages with extensive glossary. Nineteen kata, forms, of karate, the art of self defense without weapons, are presented in this book in complete detail. They have been selected by the great master and teacher Gichin Funakoshi. The book is fully illustrated with every technique of the kata along with funamentals and applications including how to make a fist, the correct form of the open hand, preliminary training in blocking, striking and kicking, the seven stances, and sparring. The book was revised and translated by the author in 1957. Karate is known to develop a person's strength, coordination, and agility along with developing his/her spiritual qualities as courage, courtesy, integrity, humility and self control. It can be practiced by men and women of all ages and requires no special equipment.